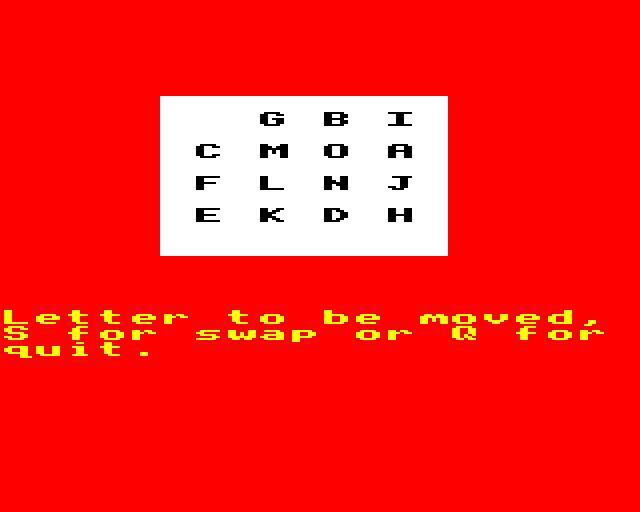 Published in the book "BBC micro programs in BASIC" from Newnes technical books. The advantage of this implementation over the plastic type is that every start condition is totally random and it is amazingly fast. Also, as a special dispensation, but only once per game, the user may swap any two letters, which is useful of course if you get into a situation you cannot see your way out of. Finally, the computer counts your moves and gives you a grading when - or if - you complete the puzzle.